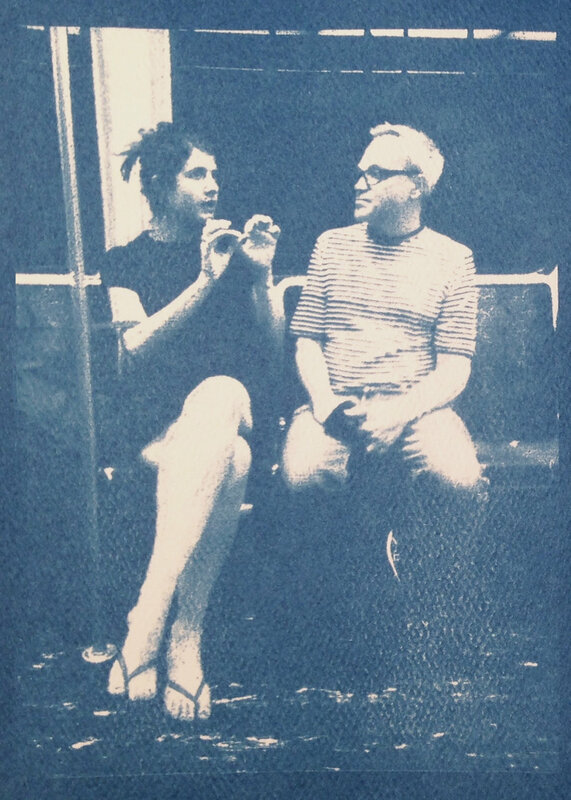 365 5”x7” cyanotypes. Arranged in 12 - 45” by 52” frames. Inspired by May Swenson’s poem “Riding the A,” this series represents the tedium of the daily commute, the innate element of voyeurism that rider experiences, and the way modern technology alters the process of creating art. The New York subway itself is the great equalizer, and there are a thousand characters – the homeless man whose lack of hygiene can clear a car, the family of tourists fascinated by the concentration of unknown, the scores of “showtime” dancers whose stunts can be both technically mesmerizing and annoyingly noisy – who make every subway car a fertile field for image creation. Every day I ride the A/C line. For a single year, I used my phone to photograph the person sitting across from me. These images were taken simply, smartphone held with no attempt to conceal the act. The moment recorded is intentional, not accidental, not curated. 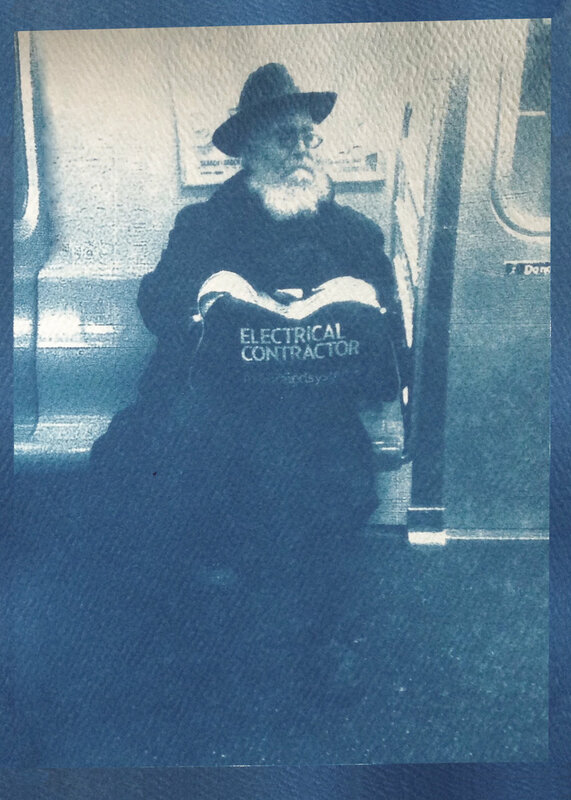 Sometimes friends, more often strangers, and occasionally empty seats appeared across the car. I choose to shoot on the subway because every race, every nationality, every religion, every age rides mass transportation. And yet my images are random. Often prosaic. 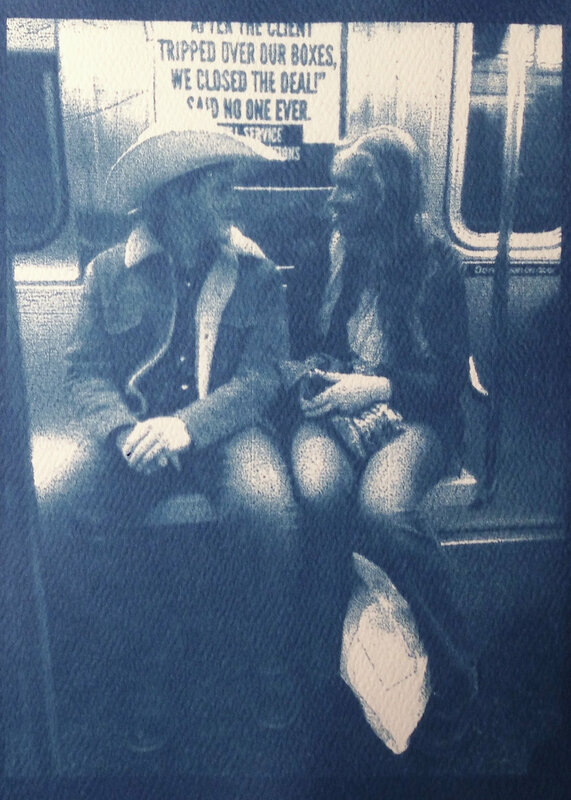 My prints deliberately differ from contemporary subway photographs in that, I do not consider slightly blurry or shaky portraits to be flawed. As our society has moved to digital media, we delete most photos we deem imperfect. In an attempt to capture a perfect moment, and forget the mundane, our society’s candid photos are often edited, even be staged. My photography isn’t curated as the perfect memory, but as a real, specific moment. My photographs are taken in real time, sans reshoots. 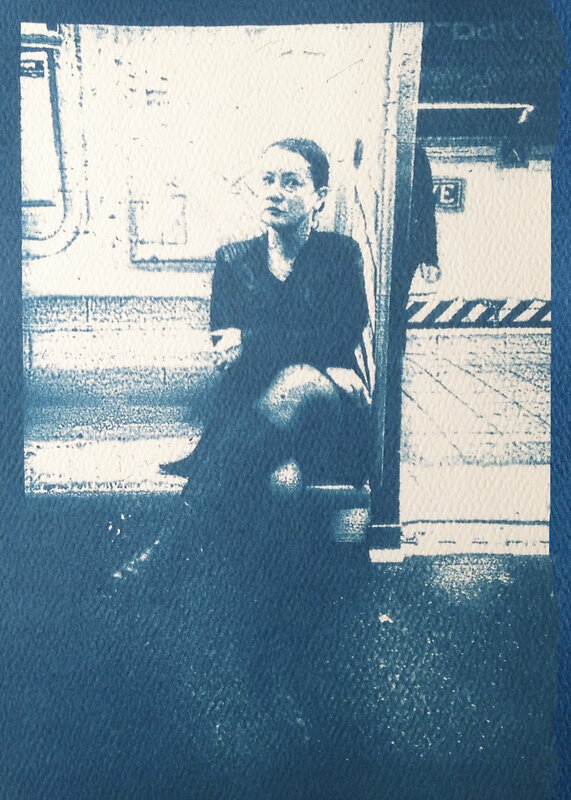 And ultimately they exist as physical prints, not merely digital images. The make the ephemeral permanent. And the subjects in turn become otherworldly, almost ghostlike. 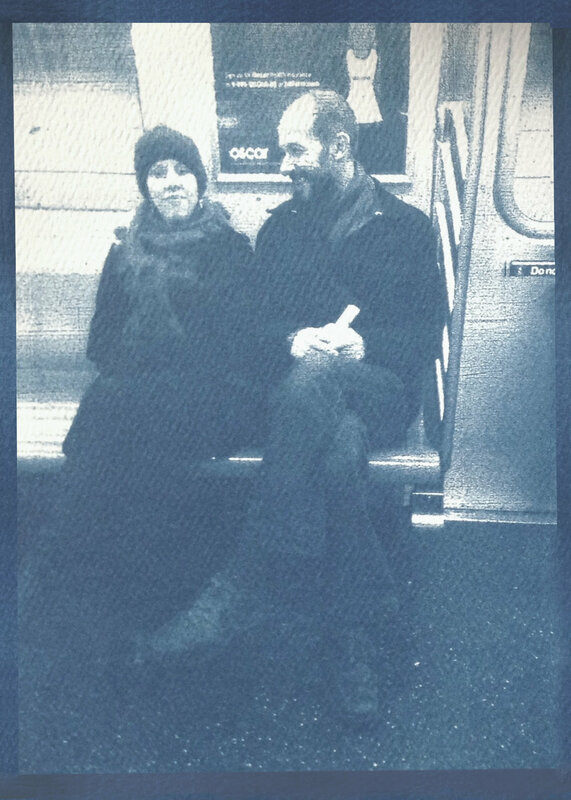 I create black and white negatives on transparency paper of these digital photographs, then print them in the sun on 5”x7” cyanotype watercolor paper. I am beholden to the weather –– a bright sunny summer afternoon creates sharp, dark blue images, in less than 2 minutes, whereas a semi-cloudy winter morning creates prints that are often soft, and can take up to 15 minutes to process. 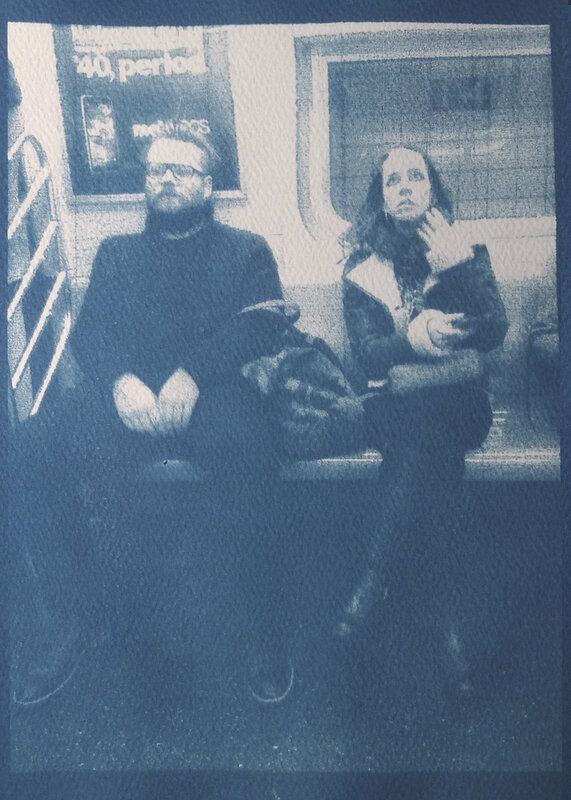 Rather than a sepia tinted or toned cyanotype, I have intentionally left the images the original blue color featured on the A/C train symbol – It is the uncertainty of the technical process and the physicality of the prints that creates its appeal. 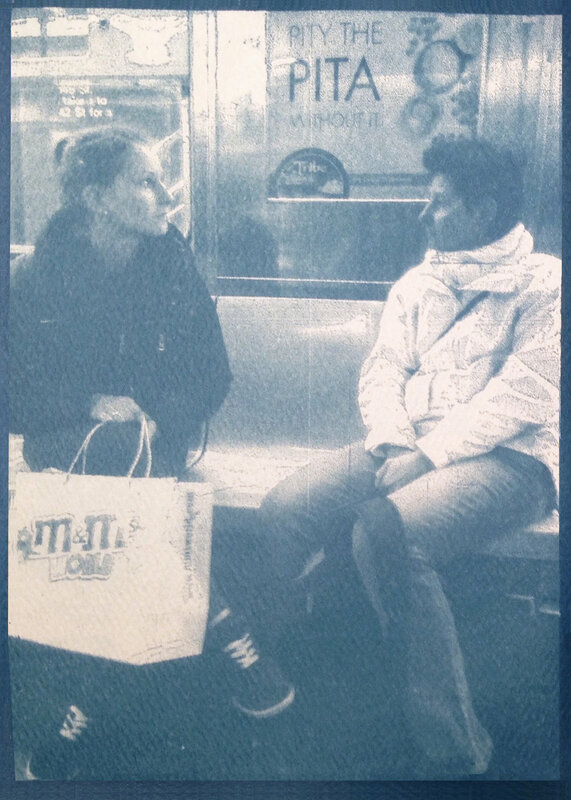 I also use cyanotypes because of its history as one of the earliest photographic processes, which seems to be at complete odds with our modern technology. We shoot photography to create the perfect memory. This isn’t a memory. It’s trying to remove the idea of creating a reality, as displaying reality as is. Once printed, the moment cannot be modified.